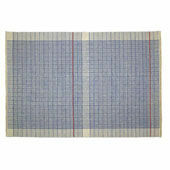 Cahier is a hand knotted rectangular carpet, made in India 100% wool, also available in 100% silk or 50% wool and silk. Knots made with the Sumak technique and 6 mm high hair. Cahier is part of a range of handmade carpets inspired by traditional craftsmanship and designs from the following countries: Nepal, Pakistan, India, Turkmenistan, China and Turkey. Each piece is made to order according to the taste and needs of the customer.